I wanted accordions and violins and cabaret pianos in a 3/4 beat & Sarah Slean lead me to him. Everything I read spoke of this extravagant, flamboyant artist, but I came to see something very different. Yes, he’s astoundingly prolific and, yes, he’s a stage animal. 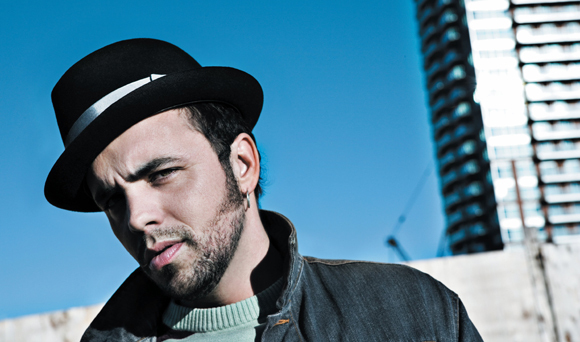 But Hawksley Workman reminds me of something a lot more calm & quiet. Trees. Earthy, robust, country-loving, he has this incredibly wise and serene display when he talks. Like ancient roots that have been around and growing since the beginning of time. And, also like trees, the other end is sky-oriented. He’s more Art than Person: creation coming out of his pores in raw emotion & delirious wit. And the voice, so immense it just rips at the seams. There are a few powerful, higher-plane voices out there, but Hawksley’s just sounds as if there is not enough room for it so it has no other choice but to overflow. One minute you let yourself get hypnotized by a waltzing mantra – the next you realize he’s singing about soup. And it doesn’t kill the magic. What a beautifully written description of the music I love so deeply. I cannot get nearly enough of Hawksley’s voice and you’re definitely right; he’s more Art than Person. Lovely weblog Isidora! Keep up the good work. Your words touched me deeply. I have never really been able to put into words the Hawksley phenomomen, because there are so many parts, his voice, his words, his arrangements, his stage presence,etc.